Would you like to rejuvenate on your holidays? At Cantabria's spa resorts you will have the chance to do this and more: you can also discover rich artistic heritage. This part of northern Spain is one of the world centres for prehistoric rock art. Come and discover it while you spoil yourself and experience new sensations. A memorable opportunity not to be missed. Come to Cantabria, in northern Spain, and relax, get in shape, or spoil yourself with a thermal water treatment for the skin. The therapeutic properties of the region's waters have been known since Roman times, and now you can take advantage of them too, at Cantabria's spa resorts. A holiday spent at one of these spa centres will not only improve your well-being, but will also give you the chance to discover the historic-artistic wealth of the region. Cantabria has more than 50 caves with rock paintings and etchings - it is one of the places with the highest concentration of prehistoric art. It is not just a question of quantity, however: the quality and significance of the remains found at these sites puts them up with the most important in Europe. They will be easy for you to discover, given that there are spa resorts very close to these archaeological sites. In Cantabria, art and well-being make an excellent combination. Come and enjoy them. At these spa resorts the aim is for you to feel good. At spas such as Puente Viesgo, just 28 kilometres from Santander, you will find modern technology alongside traditional flavour. Its thermal waters have been making people feel better since the 18th century. In Puente Viesgo you will also find the Monte Castillo Palaeolithic site, one of the most important in the world. The rock paintings to be found in its caves (El Castillo, Las Monedas, La Pasiega and Las Chimeneas) are an artistic catalogue that takes in a period of 120,000 years. Caldas Spa , in the village of Las Caldas de Besaya, is not far away. Its chloride/bicarbonate-rich waters are specially recommended for the respiratory system and the joints. From there it is only 14 kilometres to Santillana del Mar, where you will find the Altamira Caves, considered by experts to be the "Sistine Chapel" of prehistory. If you decide to go to Alceda Spa, 33 kilometres from Santillana del Mar, you will find Europe's fastest-flowing spring of sulphur-rich waters, ideal for all kinds of skin treatments. Close by, just 23 kilometres away, the Hornos de la Peña Cave is not to be missed. It is unusual because it only has rock etchings, not paintings. You have another option in Liérganes. 24 kilometres from Santander, its spa resort offers treatments for the skin and for rheumatism, and there are also spa programmes for children. You can also discover the town's rich 17th and 18th century heritage, along with the La Cárcoba rock paintings, just 12 kilometres away. 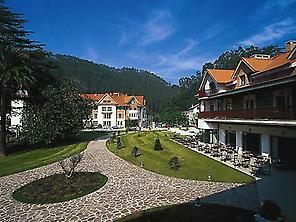 Come to Spain and discover a healthy way of enjoying art: Cantabria's spa resorts.